A generic workflow engine, configured via a graphical diagram editor on top of an XML syntax – that’s what I tried and failed to develop more than 15 years ago. I did help build three generations of a simple “workflow” component integrated in our DAM product to drive asset ingestion and export, kept reading (see The State of Workflow and Decoupling Application Logic) and writing (Workflow awareness of DAM systems) about workflows – and hoping that one day, a powerful and beautiful workflow management system would make my work easier. While Camunda is trivial to install and extensively documented, it took me a while to grasp the basic concepts – process definitions, process instances, tasks, gateways, variables – and I’m only scratching the surface so far. My example workflow is a minimal “asset processing pipeline”, extracting metadata from an asset file (using ExifTool) and rendering a thumbnail preview image (using ImageMagick) for images. This isn’t “service orchestration”, but a good enough test case to help me get to know Camunda. I used the camunda-rest-client PHP library (not an official library) to implement a simple worker process that fetches and locks an open task, calls ExifTool or ImageMagick and marks the task as completed. Asset and thumbnail filenames are stored in process instance variables. of <asset-ingestion> process instance <00a664a4-abcd-11e8-afcc-02422b22e161>. 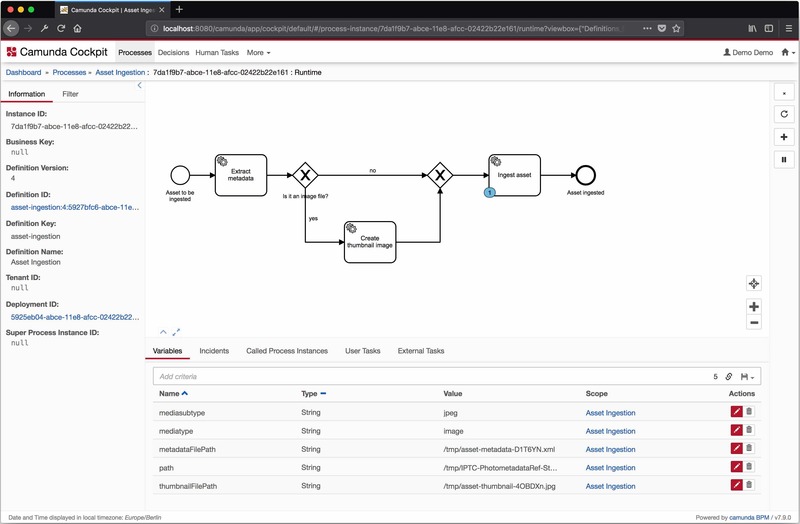 It’s pretty amazing that a simple diagram plus a single 300-line PHP file get me a separation of process flow and task implementation, queues, parallel worker processes, error handling, and insights into executions. I will definitely keep playing with Camunda. If you’re already using it in production, I’m happy to hear from you!